Finally a source for the latest information of what exactly is going on. Visit Harron's New Glens Falls Web Site! CourtTV televises court cases of high-profile people, such as Pamela Anderson, Fabio, and anyone who may be in court at the time who is a celebrity. Romance Classics is a spin-off of American Movie Classics (30), basically showing movies with Romantic Themes spanning movies of all time. Bravo is an independant-film / Nostalgia channel. It's been around for a long time. They're well known for re-running David Lynch's "Twin Peaks"
Sneak Prevue is a preview channel for Pay-Per-View movies and events. We had this channel once for 7 months between February and September of 1993. Spice airs adult programming nightly on channel 77 and is sold in nightly blocks for $6.95. You may wonder why we have not filled all the open channels. We need to maintain some for new networks not yet announced and for requests from customers that we have not anticipated. You can see what I would do if I ran this cable company! Brian's Harron Upgrade Channel Lineup is now available! I received your channel lineup suggestions in the mail and will review them. I appreciate the work that you put into it. As you may know, we have been recording customer requests for some time now. We will add new channels based on that list, the popularity of channels nationwide, and any contractual commitments that we have. We do appreciate your ideas, however. In addition, we will not activate all available channels immediately. There are many new channels in the works and we want to get customer feedback on our initial choices before we add more. If you have ANY tapes of school activities, programming, or anything else CALL HARRON COMMUNICATIONS at 793-3835 and get your tape played on cable! Channel 72 has been set aside especially for educational institutions to use as they please to promote any school activities! Sporting events, conferences, meetings, dances, guest speakers, classes, anything! It only took 5 years... at least it seems that way. began transmission of their new lineup on the Queensbury system! Friday October 10 started VH1 FULL TIME on channel 43. Thursday Oct 2. Harron started testing on the new "tier" of channels by adding channel 40 - CSPAN2, channel 42 Eternal World Television Network, and America's Health on 50. Channel 71, which broadcasts public access, was the first new channel added to Queensbury. Harron Cracks Down on Descrambler Use Harron Communications Utica branch had hired an outside agency to track down, confiscate, and fine users of cable tv descramblers. During large PPV events, they would tell paying customers of the event to view it on another unknown channel while customers stealing the programming would watch unsuspectedly on the original channel. During the event, phone numbers would flash on the screen promising free or low cost merchandise associated with the event. The unsuspecting viewer would call the number and give out their name, address, and phone number and be told their goods are on the way. Calls would then be received threatening to arrest if a fine of over $1000 wasn't paid and the device turned in. I've received many worried letters from people caught in this trap, so I guess it worked. Bob Davis, general manager of the Utica plant, failed to comment on the operation specifically. All he told me was "As any good company, we always have ongoing security programs in place. It is OBVIOUS that for security reasons we can not divulge any information that would affect an ongoing investigation." I would like to answer your questions and at the same time give you some information on cable technology and on our company as well. Let me try to explain the facts. Harron is a medium size cable TV company. It is an independent family-owned business, with about 240,000 customers spread out over New York, Pennsylvania, Texas, Massachusetts, New Hampshire and Michigan. It is not part of a huge conglomerate like Time Warner or TCI. The cable industry is highly leveraged which means that most companies must borrow substantial amounts of money to finance purchases or expansion. Harron is no exception, but because Harron is independent it does not have the kind of borrowing power that Time Warner would have. A few years ago Harron made the decision that the Utica system needed to be rebuilt. It was the largest in the company and the plant was in terrible shape. It would make our system look great. Harron then committed $24 million to that upgrade and it took 3 years. The Utica rebuild was a tremendous effort for a small company and took virtually all the resources that were available company wide for rebuilds. As a result, every other system had to wait for the Utica system to be finished. And it took longer than expected and ran significantly overbudget. This had direct impact on any rebuild plan for the Glens Falls area. There were only so many resources to go around. I don't know what you were told in the past and I don't know who you talked to, but I can tell you that in business things change. As the Utica rebuild dragged out and ran past deadlines and budgets, other rebuild plans had to be pushed back. No one lied to you. They were telling you the best information that they had at the time. But construction activity is not a science. Delays can occur and they did. But certainly there was no attempt to deceive you or anyone else. We bend over backwards not to make commitments that we cannot keep. We do currently offer some things that CVI does not. We offer the Sega Channel. Those who play Sega love this service. And for your information, we carry this service in a gap in frequencies between other channels. It is an area too small to accommodate a regular channel but works fine for the Sega Channel. Believe it or not, we have many Harron customers who used to be CVI customers who tell us how much they prefer our lineup. I agree completely that the threat of competition is certainly a big factor in why Harron has decided to upgrade the system in the Glens Falls area. We want to offer the best service possible to our customers. But if another cable company started up immediately, they would have to do just what we are doing - survey the area, design the plant, hire a project staff, order materials, hire a contractor, put up with bad weather, delivery delays etc., etc. There is no shortcut to creating 500 miles of state of the art cable TV plant. It takes time and a great deal of hard work. Queensbury NEW system activated on November 26th. The Weather Channel sent us a new computer that replaced the current model. The graphics and capabilities have been improved. We are looking at a better character generator to display community data, as seen on channel 71. We are not obligated to do so, but it certainly is a good service to the area. The new Hadley / Luzerne system was activated on August 1st. The 35 fiber optic nodes in that area were activated and now carry Harron's new 58 channel system. We began there because they have the newest plant and it could be updated more quickly. There will be dozens of fiber optic nodes serving 500 homes or less. The fiber will improve reliability and improve picture and sound quality. We have already received calls from Corinth concerning their improved pictures, based on just being on a fiber feed. In addition to more bandwidth capability in the nodes, battery backed-up power supplies will be installed to run them when electric power is not available, like during a power failure somewhere on the system. From what I have heard, DMX is not a very popular product in the cable systems that offer it. Some people, perhaps like yourself, are very into music. Most people are not. I will consider it for the future, but I would have to be sure that there is enough interest to make a profit on it. The system is being rebuilt to 750 mhz capacity and activated to 550 mhz or 77 channels, initially. The final 200 mhz will be reserved for future digital services. The plant will be fully 2 way, allowing for data to go to the customer and back from the customer entirely on cable TV lines. When we offer high speed data, you will not need a phone line to connect to the internet. This 200 mhz includes possible digital television transmissions. If you figure that each analog channel takes 6 mhz, you can figure that would allow over 30 analog channels. Now, what compression ration you use depends on who you believe. You can read about 3:1, 6:1, 10:1, even 24:1. But I would say that when the technology begins to be standardized, we will be in the digital business. It will require a digital converter box for each TV, just as a digital receiver box is needed for each TV for DSS if you wish to watch channels independently. Otherwise customers will have our analog service which will top out at somewhere between 77 and 80 channels. Our customers can now see contractors working on the poles and actually placing cable. There will be some disruption of service as areas are switched from our old plant to the new plant. We will be working on this for many weeks and months. It is a painstaking process, building new plant foot by foot, day by day. The exciting part comes as it is activated. Perhaps like when a new building is finally opened up. We are using typical cable TV architecture which is HFC or hybrid fiber coax. We use fiber optic cables as the main trunk line, and run them to individual locations called nodes. The nodes typically serve 500 homes or less. From there coaxial cable is run to each neighborhood and home. It works just fine for digital transmission as well as telephony. It is used by 99% of all cable companies. As for high speed data service, we are certainly planning to offer it. I have no guess when it will be available or how it will be offered. This year is the first year that cable companies are really rolling out this product. We do not want to be part of the experiment. We want to be part of the successful system. So we will watch closely industry results with different kinds of equipment etc. Anyone who tells you what we are planning is guessing since we are nowhere near a decision. But yes, I certainly expect that it will be available when we are ready. By the way, I know no plan to run fiber to individual homes. The cost would be monumental. Every so often the telephone companies say they are planning to do this. It would cost them billions and billions. Don't believe it until you see it. Stereo generators have been installed as part of our upgrade. All channels received on satellite in stereo are now in stereo on Harron. 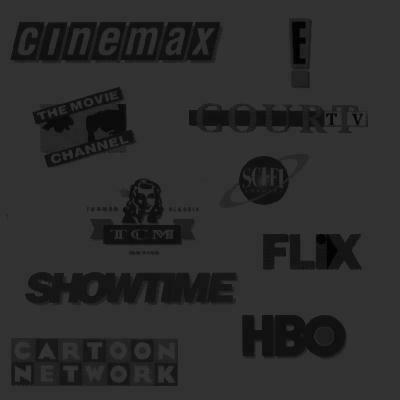 New channels installed include ESPN, MSG, TBS, Discovery, AMC, VH-1, History, Lifetime, A&E, TLC, the Family Channel, and new channels ESPN2, Sci-Fi, CMTV, and the new pay channels. I (Brian) did a comparison of Harron and Time Warner, the neighboring cable company in Glens Falls, which can be found right here. In addition, you can see my proposed line-up here! WWOR has ceased to offer its programming to cable television companies, so as of December 31st, channel 9 will now carry the Prevue Channel. The History Channel will now be on channel 34 and CNBC on channel 20, both now full time (24 hrs). 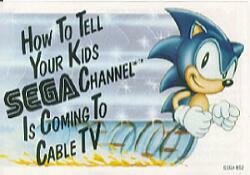 Sega Channel Added in December '95. This service allows users of Sega Video Game equipment to connect their game system into a special converter which allows the use of games Online as well as the capability of interactive game play between subscribers of the service. As far as the technical aspect, The Sega Channel is located between channel 6 and 14, which on Cable TV frequencies are next to each other. With fiber optic installation, plans are also in the works for adding high speed data service via cable modem (speed up to 30 mbps). This will allow Harron Cable to provide services such as high speed data transfers currently only available through direct T1 and T3 lines from the phone company, both of which are extremely expensive. With this technology, Harron cable may become the area's premiere internet service provider by 1999. The Unofficial Harron Communications Page is a page dedicated to providing information about any events occuring at Harron Cable that may affect the way you watch television, including future plans for expansion as well as a list of all new channels and allocations, upgrades to existing channels, and projected dates of when the work will be started and completed. which air locally are broadcast on distant stations. Sonic The Hedgehog, Sega, and The Sega Channel ® TM Sega Corp.